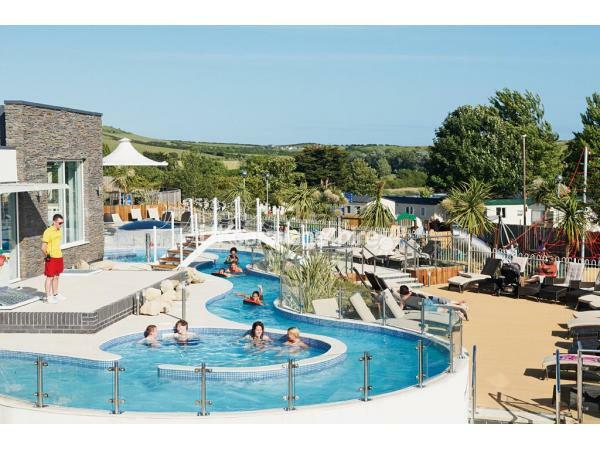 £100 deposit to secure booking, balance to be paid 6 weeks before start of holiday. payments by bank transfer or cheque please. A family owned, new van in a fantastic location. Master bedroom of generous proportions with king size bed, ensuite, dressing table, wardrobe, and TV. 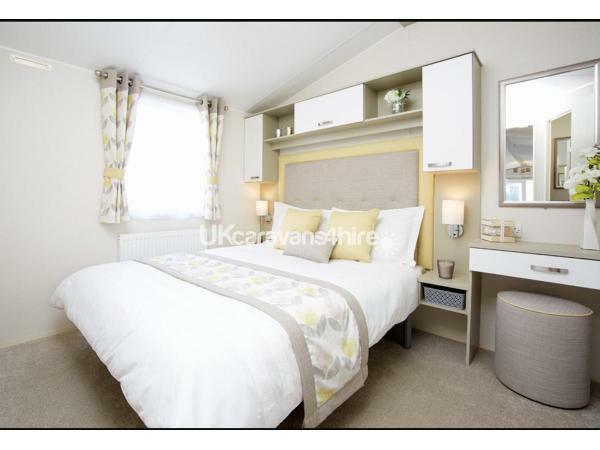 2 further twin bedrooms with ample storage. Bathroom with large shower, toilet and hand basin. 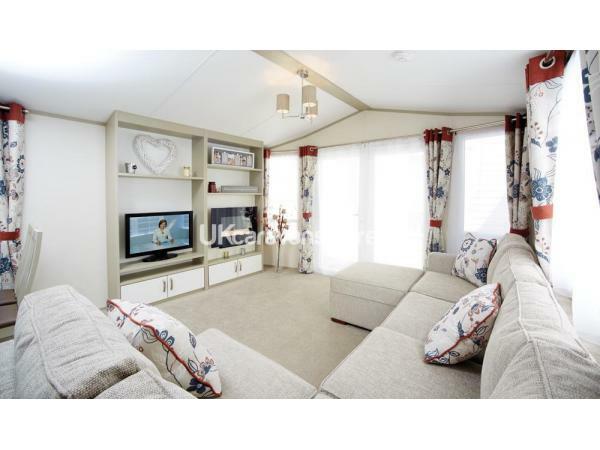 Comfortable and uplifting lounge area with TV/DVD player, bluetooth speaker and gas fire, large corner sofa opens out to sleep 2. French doors opening out onto secure decking area. 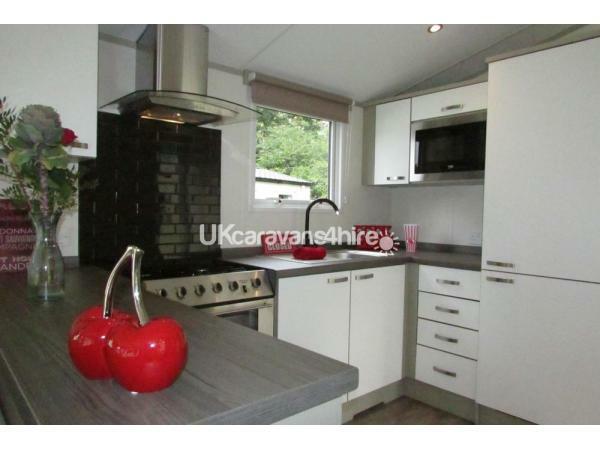 Fully fitted kitchen with cooker, full size fridge-freezer, microwave, toaster, kettle, hoover. Good selection of cooking utensils and microwaveable dishes. Dining area comprised of table and 4 chairs. Full central heating and of course double glazed. 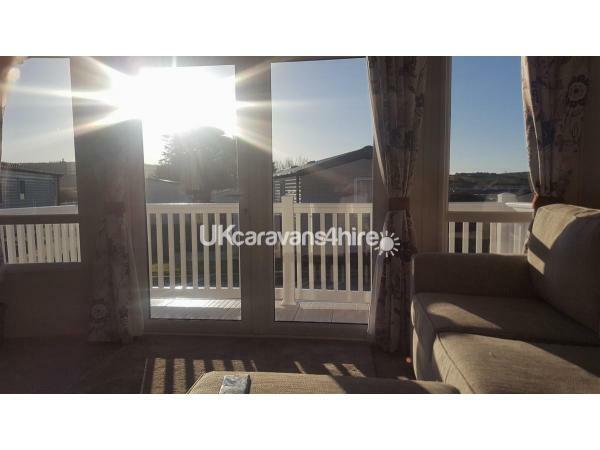 Outside the caravan is a grass area with a very sturdy table/bench. There is a dedicated parking bay next to the caravan for great access. Pillows and duvets are supplied but guests will need to bring linen and towels. Passes are not included in the price, but these can be easily bought from reception upon your arrival. Situated on the Hillview area of the camp means the entertainment complex is only a short walk away, nice views of the surrounding hills can be enjoyed from this airy and uplifting position. A full week (fri-fri) could also be arranged by application, a discount could be applicable for this extended break. Superb responsiveness from Emily on enquiries. Polite and helpful with all questions. Caravan was lovely. 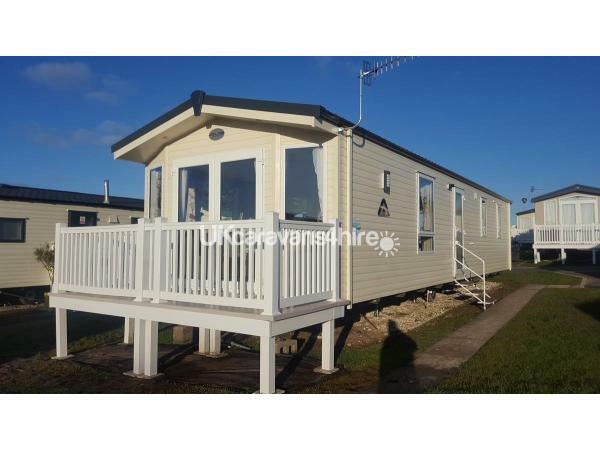 Great location with dedicated hard standing and lawn area with picnic bench. Close walk to the site centre without being impacted by noise. Side windows overlook the hill heading towards Bowleaze Cove, accessible via route over the top or round the side of the hill. Interior was lovely and bright, reflected with the good cleanliness throughout. Full equipped with everything we needed, plenty of crockery, glassware and cutlery. Large oven with gas hob and grill. Combi-microwave oven. Full size fridge freezer. Double glazing and central heating were a real bonus given the sudden change in weather whilst we were there, from unseasonable warm to overnight frost! Proper power shower with decent size cubicle, which is the first we've experienced in a caravan! Lounge was a lovely area to relax in, with flame effect electric fire, large TV and DVD player. Perfect facilities for our young family. Thanks for the kind words, glad you had a great time. We had an amazing week in the caravan! It was perfect for our family! Clean & tidy & everything we needed! The site is great! All staff are friendly and the pool was perfect! We had a wonderful stay, the accommodation was so clean, with everything we needed, and plenty of room for the 4 of us. The facilities on site are brilliant and the kids had a fab time, we have booked in again. Excellent value for money from a trustworthy couple. 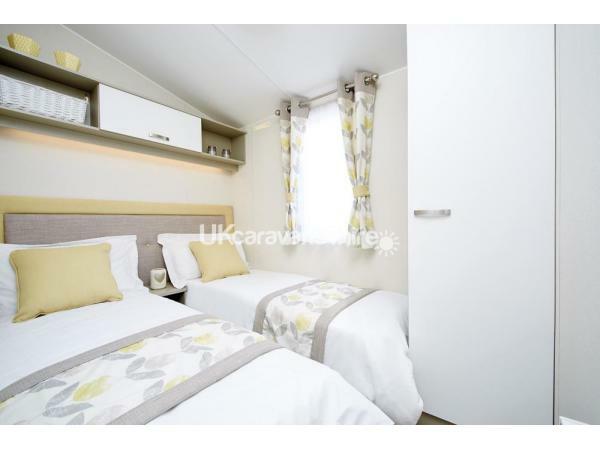 The caravan was spotless and had a lovely holiday vibe. We went with our three younger children and the parking was right outside the caravan and direct route to the main reception and all facilities. The site was clean and friendly and a short walk through a 'bridle type path' from bowleaze Cove. Would highly Recommend Emily and her family's caravan and wouldn't hesitate to come back. Weymouth is a fantastic holiday resort with one of the cleanest beaches we have ever visited. We enjoy repeating our visits several times a year! Fabulous caravan in a excellent position. Was very clean, tidy and spacious. The owners were very friendly and accommodating. Would highly recommended.